If any spider can be called cute, it’s the jumping spiders. They have quite the story to tell. Small in size, their binocular eyes represent their defining physical feature. The four eyes across the forehead is the best tip to offer for anyone who wants to know how to identify jumping spiders at least to the family level. In terms of numbers of species, jumping spiders constitute the world’s largest spider family (Salticidae). 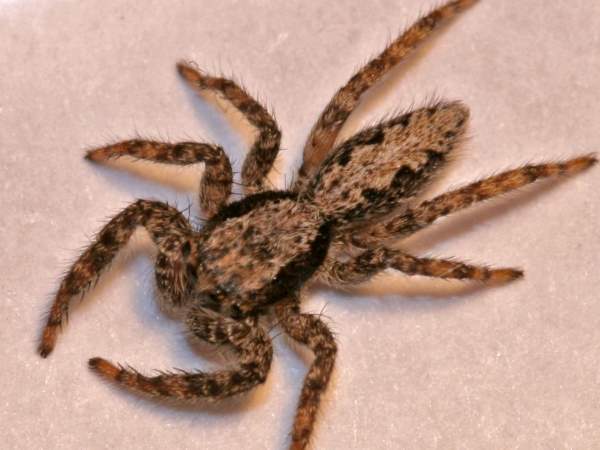 Over three hundred jumping spiders inhabit North America, many in residential areas. Given such a large number of species and genera, only a book sized review could offer a comprehensive jumping spider identification guide . 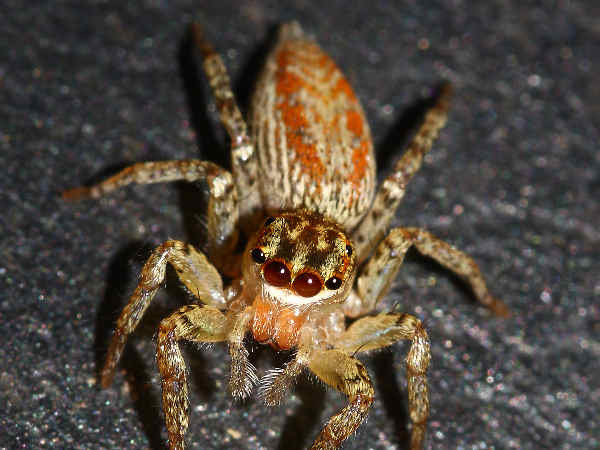 This primer of the jumping spider pictures provides a sample of representative species. 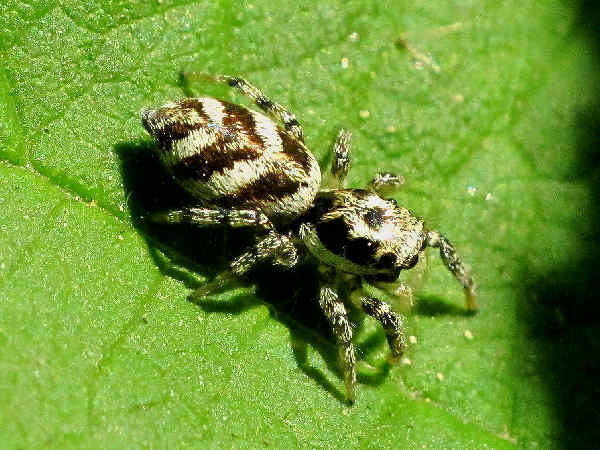 It divides into three types of jumping spiders, those in the Phidippus genera, wall jumpers and the catch all category of other jumping spicers. 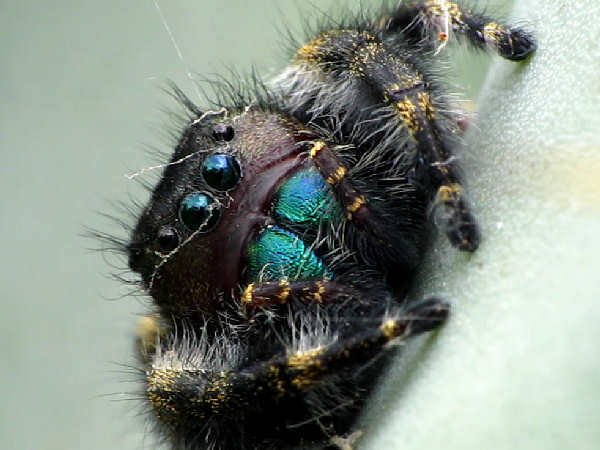 It ends with a quick overview of some newly discovered vegetarian jumping spiders. Phidippus jumping spiders, perhaps the most common jumping spiders to inhabit residential areas, can often be identified using body color. Most Phidippus species tend to show dark, banded legs, with shades of black, brown, red or yellow on the cephalothorax and abdomen. Green jaws (chelicerae) characterize the Bold Jumping Spider (Phidippus audax) pictured at the top of the page. Common in residential areas, both males (black bodies) and females (brown bodies) can often be found indoors during cold weather. 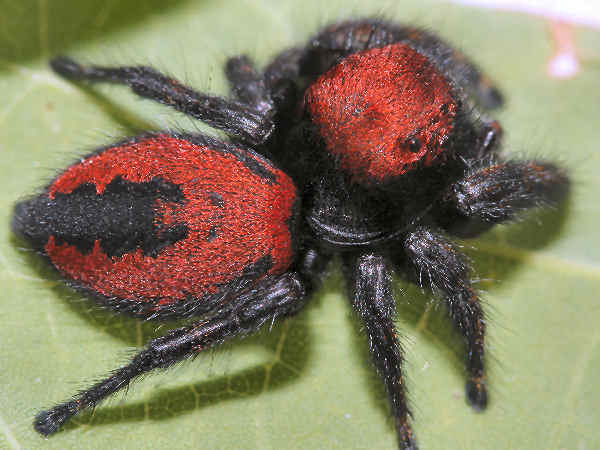 Red bodied Phidippus species also inhabit most areas of North America. Identification starts by noting the placement of the red on the body along with the patterns on the body that might be present. The first picture under this heading, for example, is of the Cardinal Jumper. The red on the head and the body are the best field identification clues. 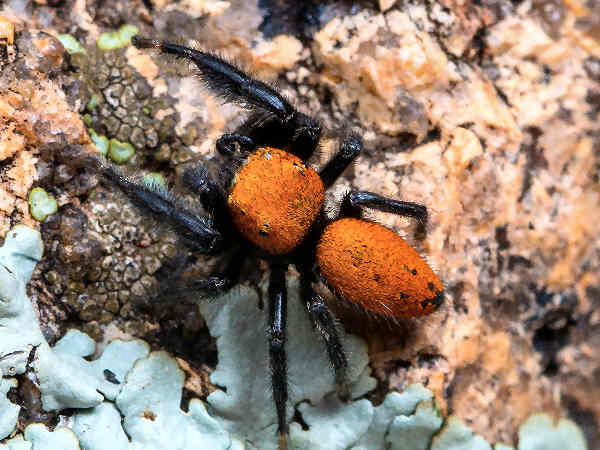 They are one of a handful of red bodied Phidippus in the Southeast and a bit of the Midwest. Compare it with the next picture, Phidippus clarus. This species is found in most residential areas of the United States. The body has a white stripe across the top, patches of red on the side and some white dots. The head is a solid black color. West of the Mississippi River is another common Phidippus, the Apache jumping spider, Phidippus apacheanus. The head and the body have red spots. The body also has a black patch at the bottom. Just ot demonstrate not all the Phidippus spcies have colorful bodies, here’s Phiddippus asotus. It has not common name. With close to sixty different jumping spider genera, it’s impossible to review all of them on a single page introduction. A few of the most common types of jumping spiders are presented here to help guide readers looking for identification clues. The pictures start with the Bronze jumping spider, (Eris militarisn). It’s an all brown spider with white striping. It’s also fairly common in most areas of the United States, so many people will cross paths with them. All five of the Hentzia species are found east of the Rocky Mountains. Hentzia mitrata has no common name. However, it’s one of the species with the wide range. Look for the white legs in the front and the overall light color. 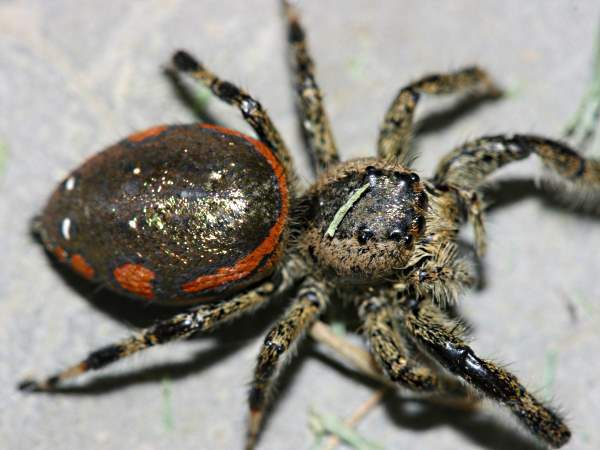 The Southeast has more Jumping Spider species and genera that other areas of the United States. It’s hard to misidentify the Translucent Green Jumper. 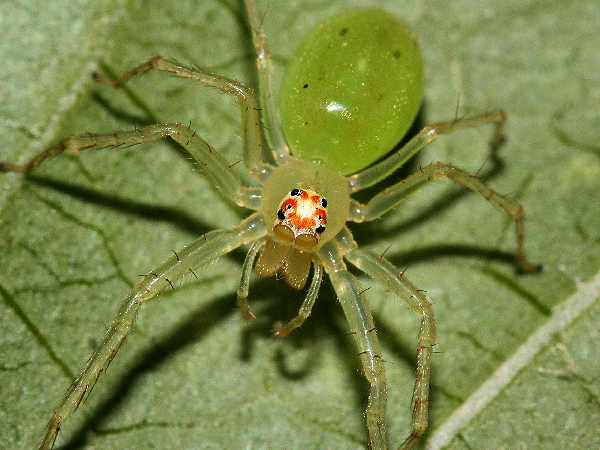 It’s the only species in the genus and has a unique look with the translucent green body. 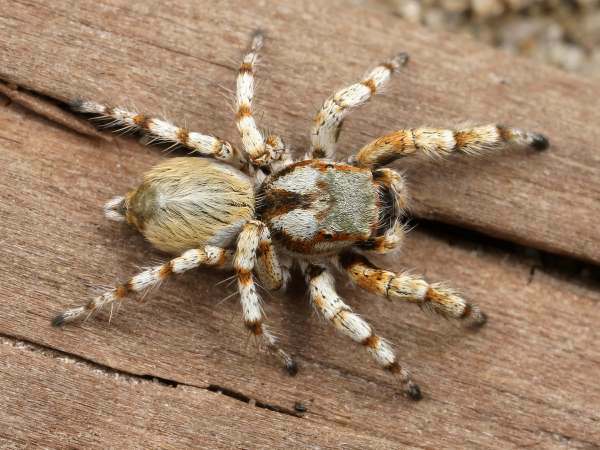 Spider enthusiasts in the West can easily identify Habronattus-amicus by the hairy abdomen and colorful legs. 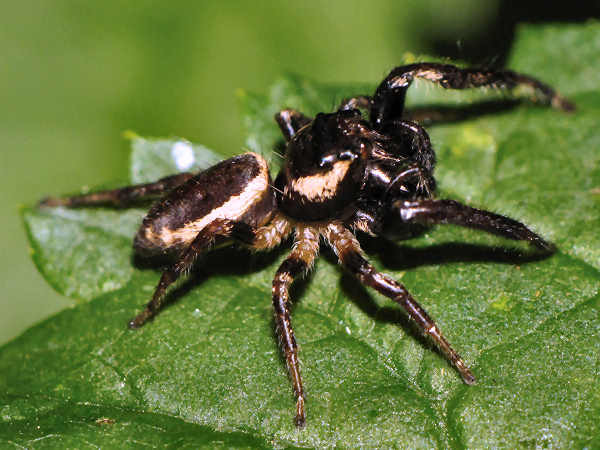 Dimorphic Jumpers are another of the common species east of the Rocky Mountains. Two different male versions are present. One has a black body. The other looks similar to the picture. white, and black markings. The female resembles the second form with faint V-shaped markings and a paler abdomen. 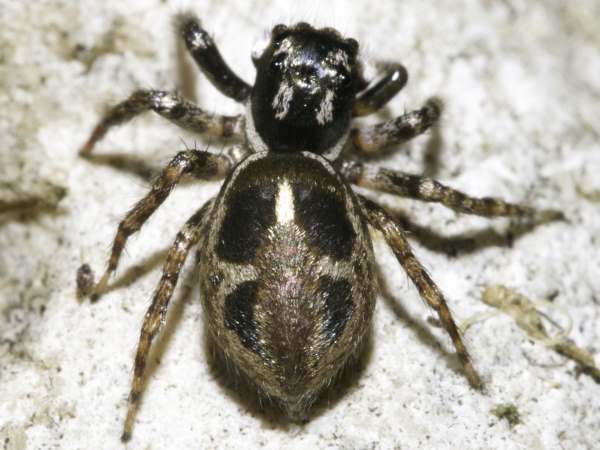 Twin-flagged jumping spider (Anasaitis canosa) are a Southern species. They are a kind of dull looking spider but the pattern on the abdomen is a good field identification clue. Paraphidippus species are closely related to Phidippus species. This is Paraphidippus aurantius. Note the red stripe around the abdomen. It’s common in the Eastern half of the United States. Sometimes geography is the best way to identify a jumping spider species. Messua-limbata is a very small jumping spider fund in South Texas and in Mexico. Note the stripes or borders on the abdomen and thorax. 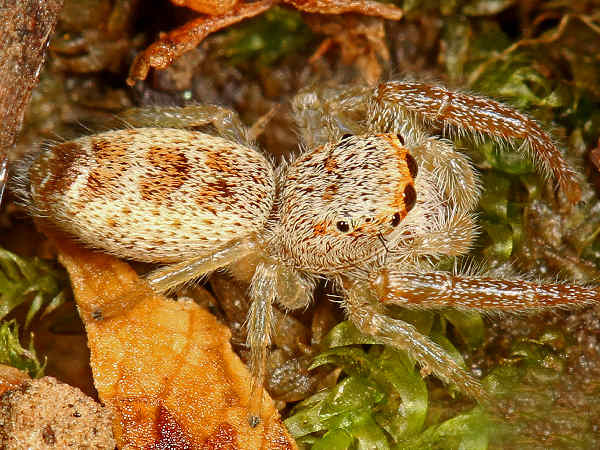 Platycryptus are a genera of dull looking jumping spiders. They have brown to grayish bodies. There’s also diamond shaped marks along the middle of the elongate abdomen. They can be found on both coasts although the body provides good camoflague. 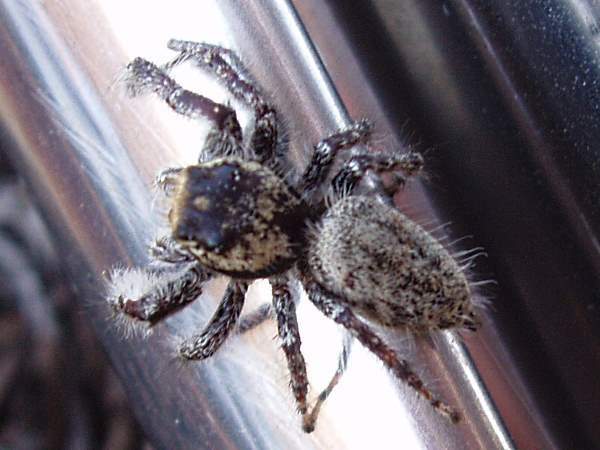 The name wall jumping spiders suggests they live on walls and consequently populate many residential areas. 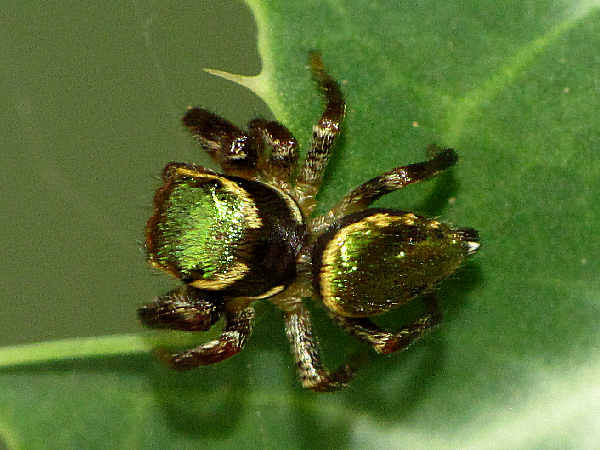 In fact, wall jumping spiders (genus Menemerus) consists of over sixty different species distributed mostly around the tropical and subtropical areas of the world. With only a few native species, they are much less common than the Phidippus jumping spiders. Gray Wall Jumper (Menemerus bivittatus), one of two native Menemerus species, lives near southern residential areas, principally Florida, Texas and California. The name almost tells the casual observer everything they need to know about the species. It is a dull color species often found on wall. 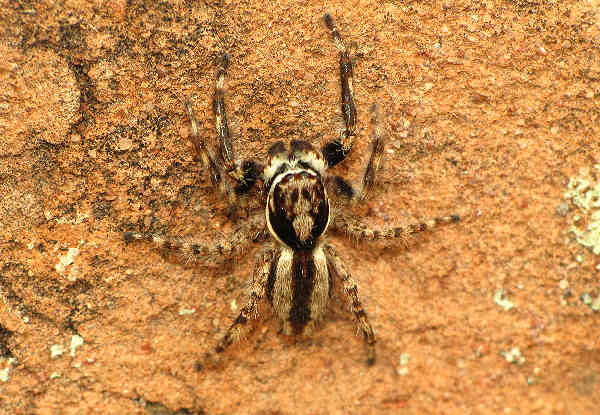 Another wall jumper, the Zebra Jumper (Salticus scenicus), lives around most North American residential areas. Very small in size, the dark and light stripes on the abdomen account for the name. Most accounts of jumping spiders include a few words about their carnivorous dietary habits. Recent research, presented at a couple of scientific conferences during the summer of 2008, introduces the novel idea of a vegetarian jumping spider. 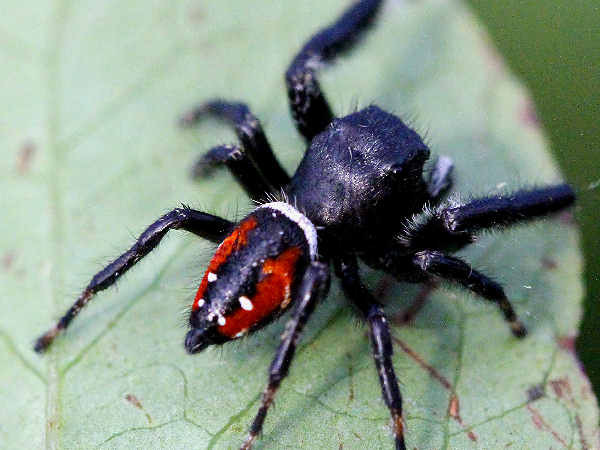 The vegetarian species, Bagheera kiplingi, is a fairly common Central American and Mexican species, that until now, received little notice except among jumping spider specialists. Accacia trees are thought to be the spider’s preferred habitat, and specimens were videotaped on the tree, living on a diet consisting primarily of Accacia leaves and nectar.